I cooked up a Mexican Menu for a dinner party for friends yesterday. 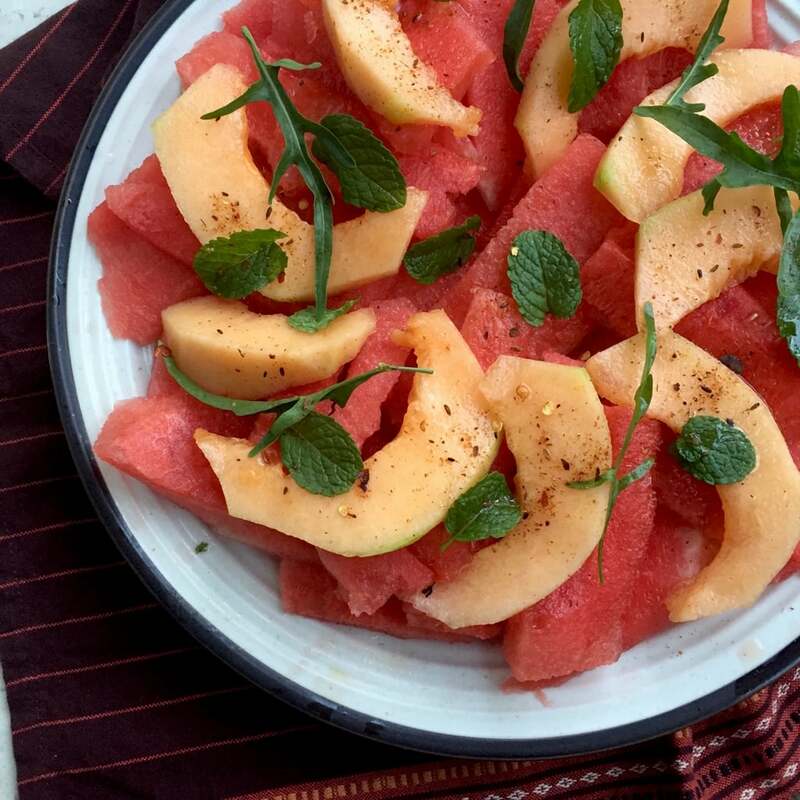 While this watermelon cantaloupe salad wasn’t really Mexican, I knew it would be much appreciated by my friends, given that Bangalore nights don’t feel very cool anymore! I have the worst luck when it comes to watermelons. They are the palest pink and utterly tasteless and I feel so cheated. But yesterday was my lucky day. I cut open the watermelon and went phew-sigh-wow, all in one breath. Ever since this watermelon deseeding hack happened to my life, I am never afraid of cutting them up – juice, salad, smoothie BRING IT ON, YO! Ideally, I’d have loved 3 coloured melons – green, orange and red, for this salad, but made do with watermelon, cantaloupe, some fresh mint and rocket from the garden. Keeping in mind the Mexican theme for dinner, a sprinkle of freshly ground chilli-salt was a good idea. 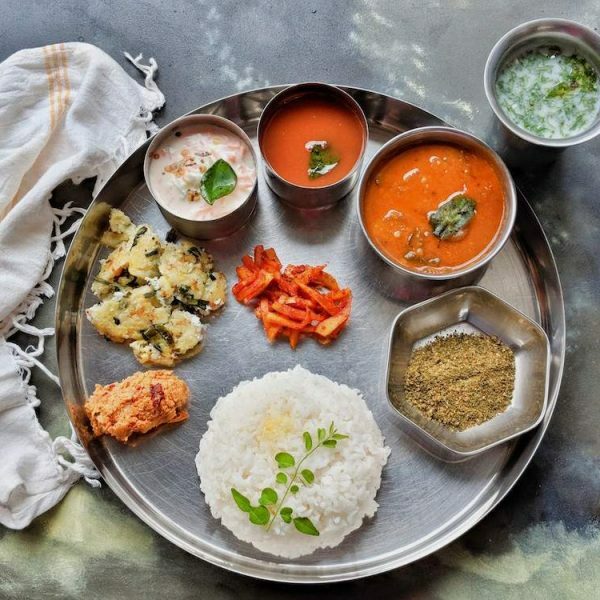 Forget all the sweating I did over the other dishes, this simple, beautiful dish was the star of the table. And it was my favourite too. Please remember to prepare this watermelon cantaloupe salad 2-3 hours in advance of the meal and chill it thoroughly before eating/serving. Try it once and I assure you that you’ll be eating it all summer. Vegan tip: You can skip the honey and make it vegan, but sometimes cantaloupes have nothing going for them, except the colour and some sweetening becomes necessary. Extras: Feel free to add crumbled feta over the top – but be warned that if you’re looking for low-cal summer dishes, it does add up calories quite quickly. 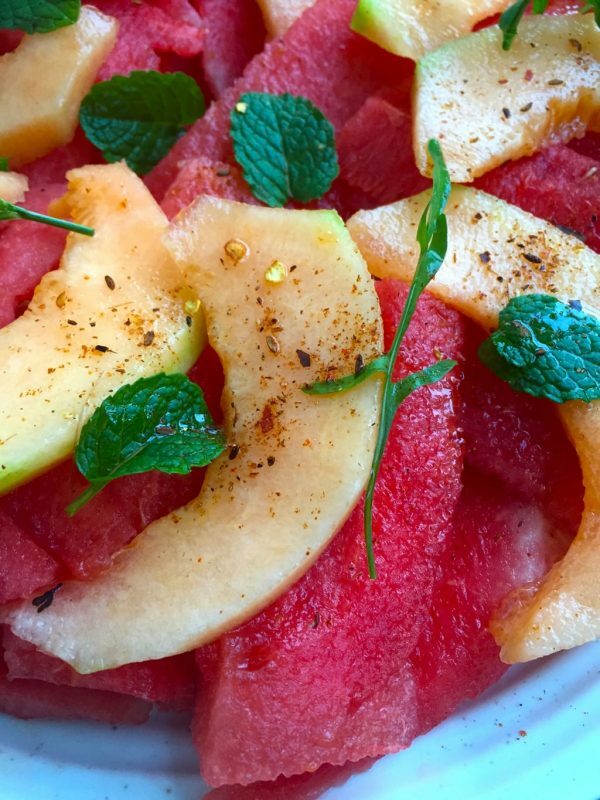 Summer Melon Salad: Sliced Watermelon, cantaloupe, fresh mint and crushed chilli-salt come together in this vibrant and fresh salad. 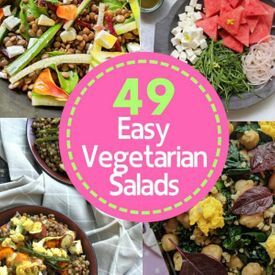 Try it once and I assure you that you'll be eating it all summer. 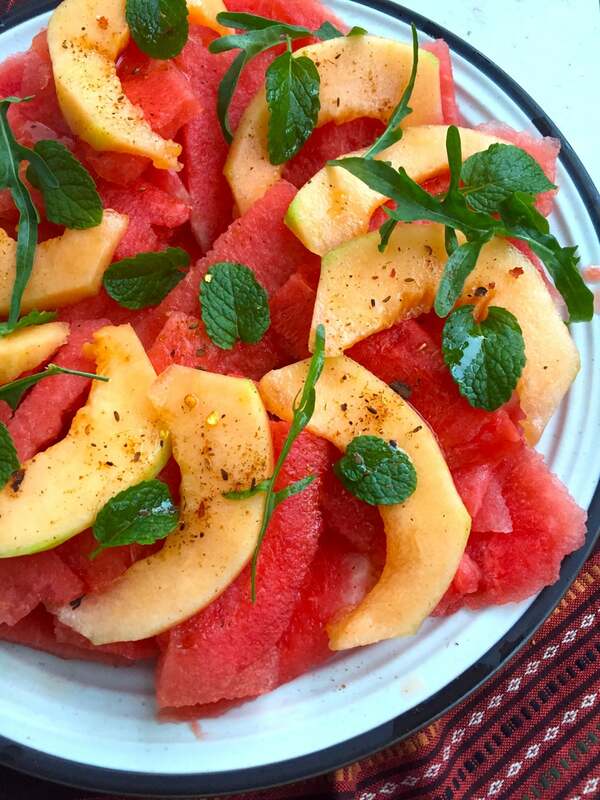 To prepare the Watermelon Cantaloupe Salad , deseed the watermelon and cut into 1 cm thick slices, two-bite sized. Deseed and cut the cantaloupe into wedges. On a platter, arrange the watermelon slices. Top with cantaloupe wedges. Drizzle the honey over the cantaloupe layer. In a pan, lightly toast the salt and cumin seeds for 30 seconds. After 2-3 minutes, crush it along with the chilli flakes in a mortar-pestle. 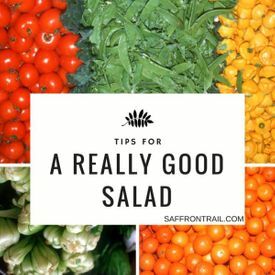 Sprinkle this chilli-salt mix over the entire salad. Spread mint and rocket leaves over the salad. Cover with cling wrap and refrigerate for 2-3 hours and serve chilled. Ripe watermelon is a decent source of vitamin C, antioxidant lycopene and beta carotene. Since watermelons are 90% water, it is a refreshing way to stay hydrated on hot days.